An American Impressionist painting by Frederick Carl Frieseke, an early 19th-century fall-front desk, a set of four Han Dynasty game figures from China, an early 20th-century clock by Austrian designer Josef Hoffmann, and an early 19th-century Indian miniature painting have been added to the permanent collection of the Virginia Museum of Fine Arts. In addition, a number of works from the estate of Paul Mellon of Upperville [Va.] -including five paintings by British artist George Stubbs - have been accepted as gifts. The acquisitions were approved by the executive committee of the museum's board of trustees this month. "We are delighted with the important additions that have been made to the museum's fine collections," says Katharine C. Lee, the museum's director. Photo by Katherine Wetzel © Virginia Museum of Fine Arts. "We are thankful for the extraordinary care and generosity that Paul Mellon has shown this institution and for the generous privately donated funds that allow our professional curators to make meaningful purchases that expand the impact of the museum's holdings." curator of American arts. The painting is now on view. A fall-front desk, ca. 1820-25, made in New York of rosewood veneer and ornamented with gilded wood, cut-brass banding, cast and gilded brass mounts, a marble top and gilt-stamped leather. Just over five feet tall, the desk is from a group of high-style case pieces made in an as yet unidentified New York shop. 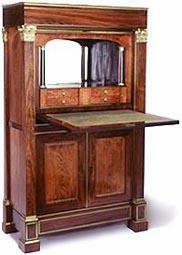 The pieces shed light on the gradually unfolding complexities of the New York cabinetmaking trade from 1800 to 1825. The desk allows the museum to "push back the 'French connection' in American art and culture by half a century," Dr. Curry says. The piece is now on view. Secrétaire à abattant, New York1820 -25. Rosewood, partially gilded marble top. 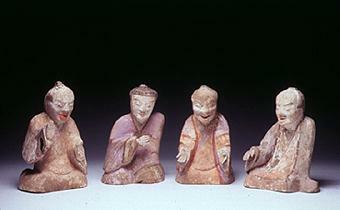 A set of four liubo game figures from Han Dynasty China, ca. 1st century BC-lst century AD, made of earthenware with pigment. Liubo was one of the most popular games in the Han Dynasty. It is played between two people using dice, counters, gaming pieces and a board. The museum's four figures capture a heated moment in a liubo game, according to Dr. Jason Sun, the museum's E. Rhodes and Leona B. Carpenter Curator of East Asian Art. Each of the figures stands just over a foot tall. The set "is the most intact and spectacular among all known examples," Dr. Sun says. A table clock, 1903-04, designed by Josef Hoffmann (Austrian, 1870-1956) and executed by silversmith Karl Kallert (Austrian, dates unknown) for the Wiener Werkstätte (1903-1932). Made of hammered sheet copper, alabaster, silver and coral, the clock stands just over a foot tall and complements a number of very important objects designed by Hoffmann that are already in the museum's Sydney and Frances Lewis Decorative Arts Collection, according to Frederick R. Brandt, the museum's consulting curator for 20th-century design and decorative arts. Calling it an "extraordinary" work, Brandt says the clock is "a masterful example by the leading Austrian designer and architect of his day." the Punjab Hills region of Kangra in India. Measuring approximately 7'A inches wide by 10 inches tall, the watercolor of "an exquisite and iconographically rich" Indian painting, according to Dr. Joseph M. Dye III, the museum's E. Rhodes and Leona B. Carpenter Curator of South Asian and Islamic Art. It depicts the Hindu god Shiva in his manifestation as "The Lord Whose Right Half Is Woman," showing that the god's nature transcends the dualities that define human existence, including male and female. Also depicted are Shiva's bull mount Nandi, "the great inseminator," and the tiger mount of Shiva's consort. "New York, 1997," 1997, an Ektacolor print by photographer Philip-Lorca diCorcia (American, b. 1953) from an unnumbered edition of 15. A part of the artist's "Street Series," the photograph measures 25-1/8 by 37-5/16 inches and was commissioned by The New York Times Magazine for an article on Times Square. It depicts evening rush hour on 42nd Street and evokes thoughts of the isolation of individuals "as they move through the decaying heart of the city during its transformation from red-light district to glitzy tourist destination," says John B. Ravenal, the museum's curator of art after 1900. 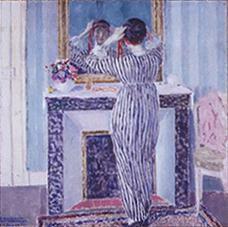 The work will be on view following the grand reopening of the Lewis Galleries in April 2000. "Standing Female," 1916, a drawing in pencil and colored pencil on paper by Alexander Archipenko (American, b. Kiev, 1887-1964). Archipenko was a pioneer of early modem sculpture and was hailed as an innovator in form and materials, Ravenal says. Cubist drawings by Archipenko are rare, and one such as "Standing Female" is particularly desirable, according to Ravenal. It dates from the height of the artist's most original period in Paris and embodies the formal innovations of the artist's three-dimensional work. It is the first work by Archipenko to enter the museum's collection. The museum expects the work to be on view beginning in April 2000. A mask ensemble of a Kuosi Society member, from the Bamileke culture (Cameroon), in mixed media. The ensemble would have been worn by a man of high status at special gatherings of the society and important state ceremonies, according to Richard B. Woodward, the museum's curator of African art. It comprises a cotton tunic - richly trimmed with Colobus monkey fur and red felt -and a bead-studded cloth mask with floppy ears and long panels representing an elephant's trunk, together with a large, beaded fly whisk and a feathered hat. The tunic is the first textile work from Cameroon to enter the museum 5 collection. A twin-handled water jar from Han Dynasty China, ca. 1st-century BC-lst century AD, made of earthenware with pigment. Standing just over a foot high, the jar looks weighty, poised and imposing with a swelling belly, a sloping shoulder and a flared pour, according to Dr. Sun. Only the British Museum and the Idemitsu Museum (Tokyo) are known to have vessels of this type comparable in size, but the examples in the United Kingdom and Japan lack the red pigment that highlights the jar. "The vessel is an excellent example of early Chinese ceramics," Dr. Sun says. box has become an icon of the Bauhaus, where Hartwig was a master craftsman in the sculpture workshop from 1921 to 1925," says Brandt. "With this design, he created one of the most successful objects of the Bauhaus School's production." The design of each piece indicates its movement in a game; for example, the bishop is a cube with a cross-cut diagonal on top designating the piece's diagonal movement. The sets sold very well when first introduced, but they are very rare today. sporting paintings include five by George Stubbs (172_1806), the leading British sporting artist of the 18th century. They will be on view at an exhibition of Stubbs' works at the museum next summer. Outstanding among the French pieces are two drawings of jockeys by Edgar Degas (l834 - 19l7). Also included are a number of animalier bronzes by Antoine-Louis Barye (1795-1875), who almost single-handedly invented the genre, and other French sculptors. Photo by Richard Caspole, Yale Center for British Art © Virginia Museum of Fine Arts. A imperial easel frame by the Peter Carl Faberge workshop in Moscow, 1896-1908, made of silver and 15 semiprecious stones; and a gueridon (circular table) made by workmaster Karl Armfelt (1873-1959) in the Faberge workshop in St. Petersburg, 1908-1917, crafted of Brazilian rosewood and nephrite with silver mounts. The frame bears the monogram of Czar Nicholas II. The table is extremely rare. "A full sized piece of silver-mounted furniture by Faberge is scarcer even that the famous imperial Easter eggs," says Dr. Curry. The frame measures 19 by 12 inches, and the table stands 33_ inches tall with a diameter of 25_ inches. Both pieces were given by the Mars family of Miami, Fla.
Six Japanese paintings spanning four centuries and two Korean paintings, one possibly 19th century and the other possibly 18th-l9th century. The gifts, from Charles Linwood Vincent of Washington, D.C., "make a substantial addition to the Virginia Museum of Fine Arts collection, with the Korean paintings being particularly significant since the museum's holdings are limited in this area," Dr. Sun says. "The Dead Doll," 1954, by Ivan Albright (American, 1897-1983), an unnumbered lithograph on cream wove paper from an edition of 44. Albright, who painted the picture of the aged Dorian Gray in the 1947 MGM movie, considered "The Dead Doll" to be one of his most important works It is "an excellent example of his unique style, technical virtuosity and thematic exploration," says Ravenal. The lithograph is the first work by Albright to be added to the museum's collection. It measures 17_ by 251A inches and was given to the museum by Gabe Wharton Burton in honor of Dorothy Haas Rautbord and in memory of Ryerson Williams Potter. "The Poet" from "The Blue Guitar" series, 1977, by David Hockney (British, b. 1937), a five-color, hard ground and aquatint etching on mould-made paper, number 141 of an edition of 200. Hockney has been an important figure in contemporary art since his emergence in the 1960s. Ravenal calls the etching "spare and elegant." The series was inspired by the Wallace Stevens poem, "The Blue Guitar." It was given to the museum by Mr. and Mrs. Joseph Awad of Richmond.